Fish and chips with a few gourmet touches to make it special. The chip shop just won't be the same after this. For the tartare sauce, make a mayonnaise by mixing the egg yolks, Dijon and vinegar to a paste. Slowly add the vegetable oil in a thin stream, whisking all the time. When emulsified, mix in the rest of the ingredients. Set aside. For the pea purée, gently fry the shallot in the butter and salt in a pan. Add the peas and sugar, then pour in the chicken stock. Bring to the boil and cook until the peas are tender. Strain, reserving the cooking liquor in a jug. Transfer the peas and shallots to a blender, add the mint and a few tablespoons of the cooking liquor. Blend to a purée, adding more cooking liquor as required. Season to taste with salt and pepper. Keep warm. For the chips, top and tail the potatoes and cut into chips using an apple corer (alternatively cut into chunky wedges). Bring a pan of salted water to the boil and blanch the chips until soft, but still holding their shape. Remove the chips with a slotted spoon and drain them on a perforated tray (alternatively use plates lined with kitchen paper). 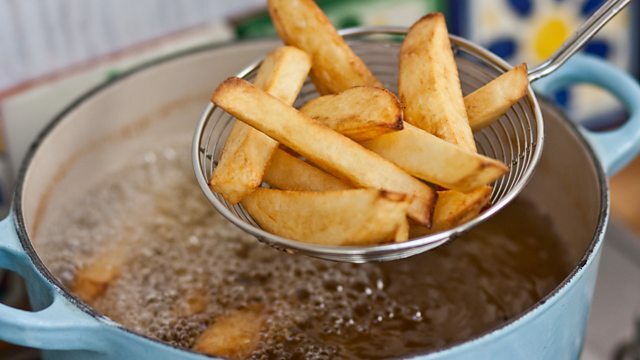 Cook the chips for approximately 8–10 minutes, or until the oil stops bubbling (which means that the moisture has been removed). You will need to do this in batches unless you have a large fryer. Remove the chips using a slotted spoon and drain the chips on a perforated tray or plates lined with kitchen paper. For the battered fish, beat the egg whites until very soft peaks form when the whisk is removed. In a separate bowl mix the flour, bicarbonate of soda and sparkling water together. Stir in the egg white mixture. Mix to just combine, but don’t over work (a few lumps are fine). Set aside to rest for 20 minutes. Preheat the deep-fat fryer to 180C/350F. Deep fry the chips for a second time until crisp and golden-brown. Meanwhile, sprinkle some flour onto a shallow plate. Dust the fish pieces with the flour, dip in the batter and deep fry until the batter is golden-brown and crisp (you may need to do this in batches). Season the chips, to taste, with salt and serve immediately with the fish, pea purée and tartare sauce. The recipe makes more tartare sauce than you're likely to need, but any leftovers can be stored in the fridge for another time.